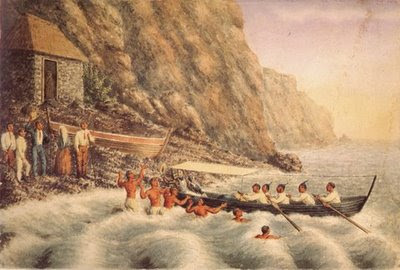 The last picture from Isabella de Franca's journal of her first visit to Madeira in 1853-4 illustrates the perils of launching from a beach. She has just visited Calheta, then a remote hamlet but now a rather suburban place with holiday villas stretching up the hill. Today the beach is artificial, held in place by a sea wall. I like the boat. It has five oarsmen, like a British naval whaler, and tall posts sticking up from the stem and stern to hold a line supporting the canopy at the stern. Everyone looks as though they are having a whale of a time.